Jake Pendleton is back with urgent mission in book four of Chuck Barrett’s popular series. It’s a treat to be back with him too! In Disruption, we are pulled into the world of hacking—about as current a topic as you could choose. A global disaster is ‘scheduled,’ dependent on just a few men. Jake and his partner, Francesca Catanzaro, must stop it. Off on an international hunt that leads them to far more questions than answers. Take any one industry or company. A bank? An airport? A hospital perhaps? Now unplug it. Completely. Disable all computers and all they control. Can we imagine at this point, what all that would include? Next, take that city wide. Then nationwide. Finally, the world. Once begun, could anyone stop it? Once begun, could the world ever recover? Jake and Francesca begin with a search for one man, a hacker, who may hold the answers. What they find is another body. Then another. Next stop, Italy, where Italian officials want credit and much more. Then questions about a missing plane surface. That and more add to the mix, causing Jake to question even those closest to him. Lots of twists, unlikely associations, and many players with their own purposes, all lead toward one main confrontation. And, as you might expect, time is running out. Mr. Barrett has written a very fast paced, exciting novel that actually does keep you on the edge of your seat. The story is believable with hackers we have heard of lately. The author will have you wondering who to trust, who to follow, who might be killed, including those close to Jake. Highly recommended and always a great listen. As part of the book tour for Disruption, sponsored by iRead Book Tours, I received the ebook. Then I bought the audio through Audible as well. Narrated by the wonderful Scott Brick, the book is a fantastic choice for listening. Hear a sample here. See if you don’t agree. This novel is a terrific stand alone story, but the first books in the series are wonderful as well. They are all below, in case you prefer to start at the beginning of the story. Read more about the tour here as well. You will find Mr. Barrett at a variety of sites with articles, interviews and reviews. Check them out. He is a great author. In addition to writing thrillers, Barrett speaks and conducts workshops at book festivals, book clubs, reading groups, writers conferences, and writers groups. 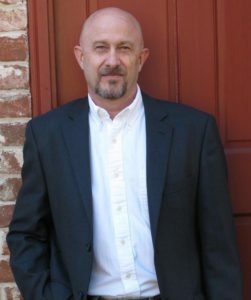 Some of his topics include Nuts & Bolts of Self-Publishing based on his book—Publishing Unchained: An Off-Beat Guide To Independent Publishing—as well as, Blueprint for a Successful Book Launch, Getting from ‘Idea’ to ‘Finished Manuscript,’ Mysteries & Thrillers: Fact or Fiction, and Adding the “What if” in Storytelling. Thank you for the wonderful review and post!